Surprise. Mitch McConnell is lying. Mitch McConnell refuses to bring the "protect Mueller" bill to the floor despite (or because of) the fact that it was co-sponsored by Republicans. He said, "I don't think he should fire Mueller and I don't think he's going to. So this is a piece of legislation that isn't necessary in my judgment." Friend of a professional contact was having breakfast this morning, and told him some of a conversation he said he overheard Sen. Mitch McConnell having nearby. 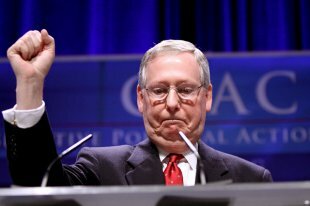 (He told my contact that McConnell was not speaking particularly quietly, he was not trying to eavesdrop). "Nothing new under the sun . . . Presidents have paid women before . . .Trump has no legal talent around him, so we are heading to a Constitutional crisis . . ."
Then, the friend of my contact said, McConnell talked about "staging a play," which he did not exactly understand. And he heard McConnell quote someone saying, "We have created a Frankenstein." Then, the friend of contact said, McConnell and his breakfast companion talked about "stalemates." ..."Stalemates are better ... that is what we discussed at our GOP meeting this week." McConnell's last comment, according to the friend of contact was, "When they ousted the Kaiser, they got Hitler." The takeaway for at least my contact was that McConnell thought we are headed for a Constitutional crisis, that Trump would take some precipitous action, regarding his legal exposure, and that McConnell seemingly intended to try to protect him. Obviously, he knows Trump is going to go nuclear on the investigations. And he's going to help him "stage a play." Of course. And if Trump is the Kaiser, does he think Pence is Hitler?